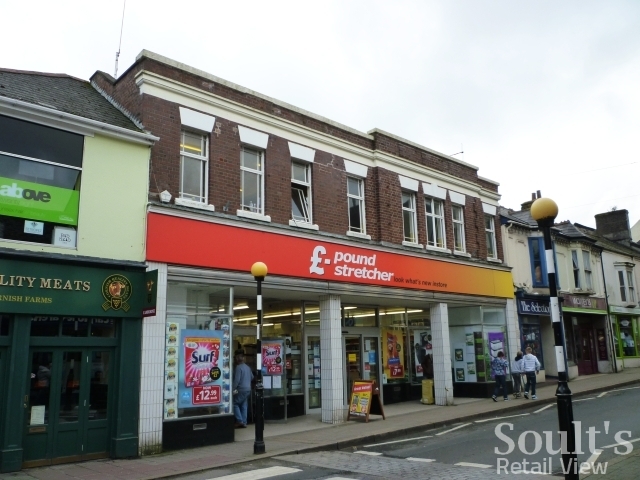 A few days ago, I blogged about how Poundstretcher in Newcastle needs to sell itself better in order to capitalise on the extra footfall generated by the opening of Discount UK opposite. 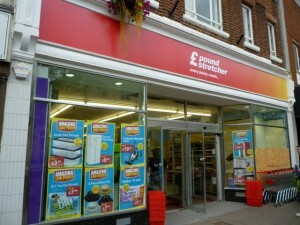 I argued that the quality of Poundstretcher’s products, and its homewares in particular, is much higher than the shoddy advertising board and lacklustre store environment would lead shoppers to believe. Sadly, presentation issues seem to permeate throughout the 350-strong chain. On Thursday last week I was touring South Yorkshire, and took the opportunity to visit the Poundstretcher in Wombwell, near Barnsley. The experience, I’m sorry to say, was very poor. 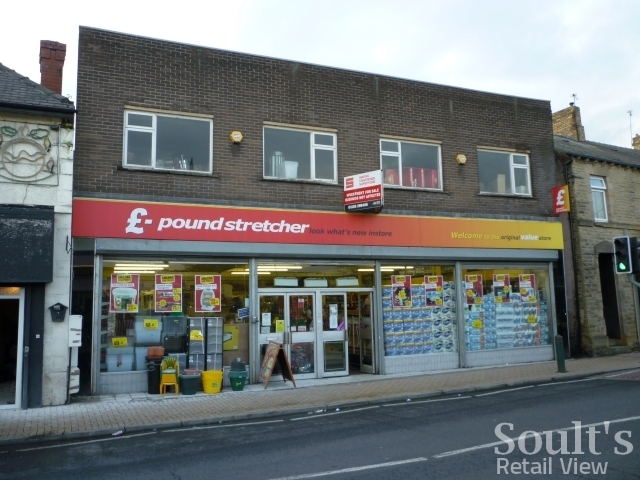 Externally, the shop at least ticks one box by featuring the latest Poundstretcher logo and fascia, which is increasingly replacing the disparate visual identities across the chain. However, the cluttered frontage of plastic containers and window posters offers neither an attractive shop window, nor views into the store. 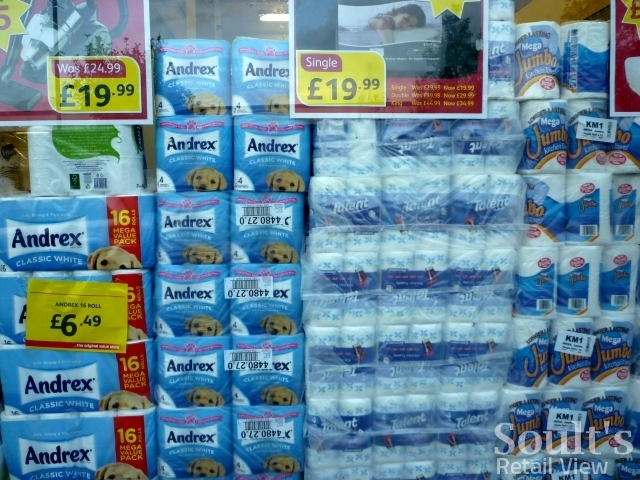 I was especially puzzled by the stacks of Andrex that filled the right-hand window – surely no-one can think that this creates an appealing first impression? Inside, I was shocked by the state of the shop, which was generally untidy and had litter on the floor. Poundstretcher makes an unfortunate habit of piling display stock in the aisles as well as on the shelves, but much of the product on the floor here was in unpacked boxes. As well as making the shopfloor look like a stockroom, it would have been impossible for anyone with a pushchair or in a wheelchair to negotiate the store. 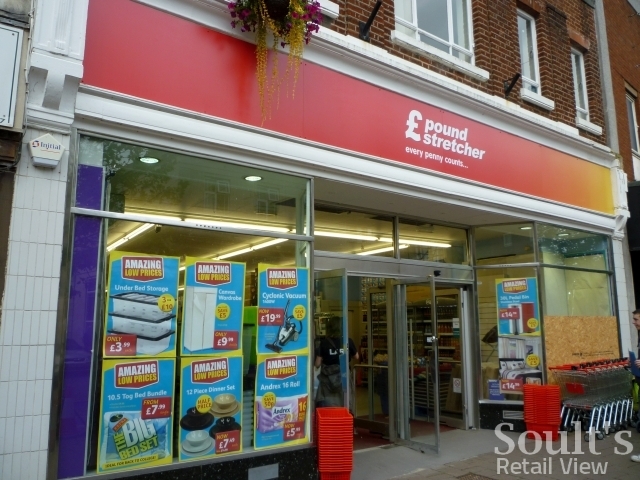 If the branches are holding more stock than they can physically store, this is a supply chain issue that Poundstretcher’s bosses need to tackle. In the meantime, Wombwell’s shoppers can be forgiven if they opt instead for the shiny, modernised Wilkinson store over the road. Though Wombwell is an established Poundstretcher branch, a lot of the same flaws apply even to the newly opened branches – many of which are in former Woolworths locations. 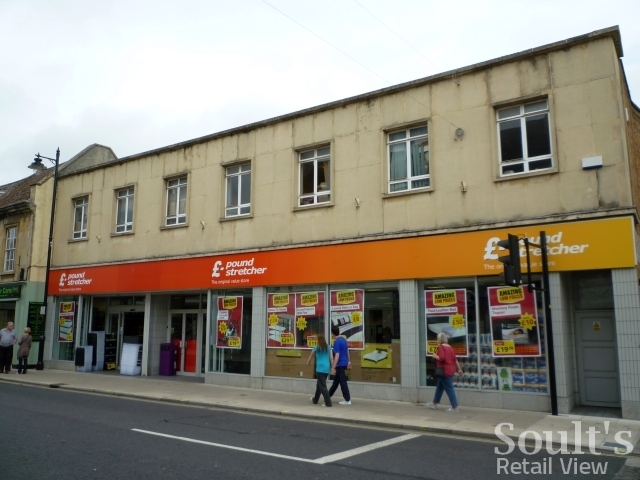 As well as the stores in Camborne and North Berwick that I’ve mentioned before, I’ve recently paid visits to the new stores in Tiverton (one of the ex-Woolies sites acquired from Alworths, and opened in May) and Melksham (the last former Woolworths site in Wiltshire to reopen, in September last year). While these new stores benefit from being generally cleaner than the older shops in the estate, there are still issues with products cluttering the aisles and an excess of both goods and promotional posters in the shop windows. 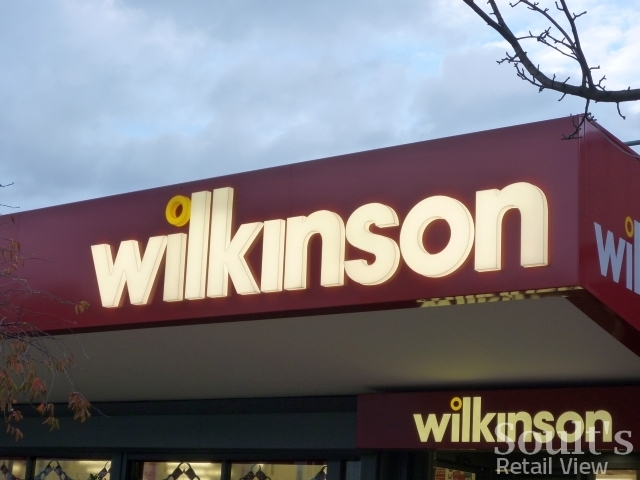 In contrast, modern variety store retailers such as Wilkinson, Discount UK and Home Bargains manage to combine a strong value offer with stores that are still clean, bright and appealing, both inside and facing the street. Poundstretcher’s product is strong (yet currently undersold), and the retailer is finally getting to grips with the historically confused brand that sees page 1 of Google Image Search bring up six different logo variations. Clean, tidy and accessible shops are a retailing basic, however, and Poundstretcher could do worse than to learn from – and pay some Soult-style visits to – its shinier value competitors. As a former employee (thankfully) I came across this article and I agree 100%. Stock was always sent to us in bigger quantities than we could sell the stuff. This resulted in overfilled warehouses with nowhere for stock to go (I recall on several deliverys we had to unload the pallet outside in the street because it would not fit in the warehouse). Because they do not rely on each store’s stock list to send in what a store needs, you end up with deliveries of stock which cant go out on shop floor. An example of the stacking boxes on shop floor could be that they send in 10 big boxes of cushions, a member of staff takes that box from the warehouse to put out, they only manage to get 2 on the shelf before the shelf is full, but they know there’s no space in the warehouse to put the amount left in the box back. I looked at 1 of the store’s window display pics and actually thought that looked like 1 of the stores I worked in. I worked in several and they were all like that. The orders of putting stock in the window that way were direct from head office and area managers who visited the stores. It does make them look ugly. I agree with Steve, £stretcher are a cheap product retailer but they are seriously failing at that market, with recession times they still cant manage to be on top so really have no chance. Hi soult. Not sure if you realised that there was a Woolworths in Wombwell, (store 1122) located next to the Wilkinson you took photos of. The store appears in the 1972 list, and must have closed between 1978 when I was born(my mum remembers how when pushing me through the checkouts in my pushchair and me picking up a ladybird book, only realising when we’d left the shop, and had to return it), and 1983 as it doesn’t appear in the list of closed stores between 1983-1995 in the 1995 store list. Hi Lee, don’t worry, I got it! :) I still need to blog about that store, as well as the long-gone ones in Mexborough and Goldthorpe that I captured on the same day. Perhaps a task for this weekend! I think you’ll see their warehouses full too, I don’t think stores will be getting more stock than they can store, rather it’ll be poorly bought product which clutters the store, slow moving or product not attractive to customers. The buyers are tasked with getting what they can and getting a return on it so shipping it to stores rather than having it sitting in a DC is what they want – ‘can’t sell it from depot’ after all. Naturally these sort of stores rely on stacks of product all over to drive their sales per sq ft metric upwards and squeeze a bit more out of the customer too. It doesn’t make for a good shopping experience I agree, the one near me features several stacks that you feel with one nudge would topple straight over. 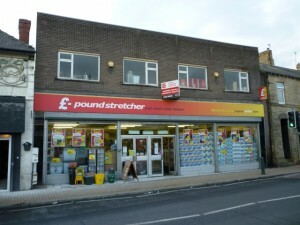 Like someone mooted on Retail Week earlier this year, if Poundstretcher can’t thrive in this ecomonic environment, one that presumably plays right in their hands. Then they’ve no hope of surviving longer term. 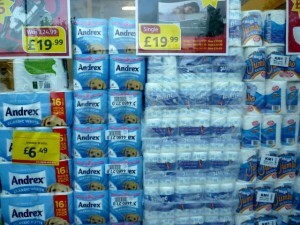 My wife insists on visiting poundstretcher when we are near one. I hate it. They give me a cold sweat when I’m in one as they are dirty, grubby and horrible. Some of the older shops have serious health and safety issues, not just with the amount of stock cluttering the shops, but with shelving gondolas that are one knock away from collapsing. Have a look next time you’re in an old shop. Back panels (crucial to the integrity of the unit), missing all over the place along with other issues.